Okay, this is really a forgotten book, since it's Finnish - and I don't think anyone's read that even in here for at least 20 years. It just so happens I read it last night and thought it might be of interest to someone reading this blog - there must be some Finnish readers among the bunch. 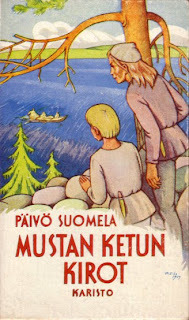 Päivö Suomela's Mustan ketun kirot was published in 1955, by Karisto, in their pretty low-down juvenile series called Poikien kirjoja (Books for Boys). The books in the series are not very collectible, even though I know there are people who are looking to fill the series. The book's title means translated "The Curse of the Black Fox". There's no supernatural element, though, which is a shame - and I was actually looking for one, since I've been planning a book of Finnish sword & sorcery stories and when I saw this at a bookseller in the Turku market square, I thought this might have something I want. No such luck. The book is set in the 15th century, but you don't know it from anything other than that there's a mention of the time in the short foreword. The characters have names that purport to sound like ancient Finnish or Kalevala-ish (Sipi, Osmo, Haveri), but the book could still take place even in the early 20th century. There's not much action and it seems at places that the author forgot where he was taking his story. It's relatively entertaining, though. The book could also be a western. It's about a boy and an old man who live somewhere in the Finnish frontier. They are robbed of their furs - which contains a fur of a black fox. The young boy sets out to track down the thieves and runs into another young boy called Marjo. (There's a hint of homosexual attraction, until it's revealed in the end that Marjo is actually and safely a girl!) The same events could take place in Wild West in the 1880's. Päivö Suomela was a son of the Finnish sports writer and educator Klaus Suomela and the juvenile writer Launo Suomela was his brother. I believe both worked as teachers. Päivö Suomela did also the cover illustration for his book. I think it's pretty nice. Päivö Suomela wrote a dozen or so other juvenile novels in the fifties and sixties. Hell, I seem to be more active in my other blogs than this one... 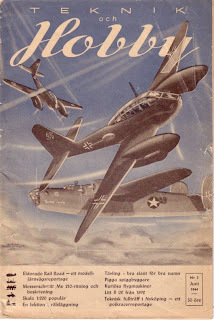 Here goes nevertheless: another post on Finnish war-time magazines here. 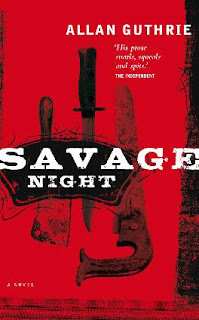 Allan Guthrie's Savage Night (2008) is not an easy feat. It's not entertainment, even though it's wildly funny, in a way you just can't anticipate. I'm sure there are people who find it unethical to laugh at people who hack off other people's limbs and heads, but that's only choice Guthrie's characters have given the circumstances they live in. Guthrie moves the tragedy of a Jacobean plays (i.e. John Webster's The White Devil from 1612) to the underbelly of Scottish lower-to-middle-class and their everyday struggle. This is no social realism, though, more like hyper-realism. Guthrie's characters are always convincing, that must be said. The prose it's so sparse and hard I had first trouble getting into Guthrie's writing and its rhythm. Guthrie doesn't make it easy for the reader to get into the flow, even though the events described make you turn the pages feverishly. There's almost an experimental quality to Guthrie's writing (and I want to remind I compared Guthrie to Vladimir Nabokov when I was reading Hard Man). I watched last night an Italian film called Citta Violenta aka The Violent City. It's one of the better Italian crime films from the sixties and seventies, with Charles Bronson and Telly Savalas in the lead. The director is Sergio Sollima, who has been gaining cult status in recent years, also due to his spaghetti westerns (which I haven't seen, I'm sorry to say). By no means Citta Violent is a perfect film. Some of the dialogue is corny, some of the actions are not very well motivated, some of the actors are poor (especially Bronson's wife, Jill Ireland), and I'm not really sure if I like Bronson. I think this would've been better for someone like Lee Marvin or Barry Nelson. Having said this, I must confess the film has a great style, lots of scenes without dialogue or even music. The climax - shooting in the scenery elevator - is a tour de force. The story line, lifted up from Out of the Past, is a complex one and is truly noir, with everyone dying in the end. Someone said when this came up in Facebook that the film is very Parker-like. Bought this earlier today from the Turku market square, where there's a bookseller. It's a Swedish hobby mag from 1944. The illustrator is called Björn Karlström and I know nothing about him. The illo is great, though. The German plane is presumably Messerschmitt Me-210, which I know only because there's an article on the same plane in the inside pages. Quote from the City weekly in 1991. Sorry 'bout being in Finnish. 1. Tapani Backe on oikeasti tietenkin Bagge. 2. Tapani kirjoitti FinnWestejä, niin kuin muutkin sarjan tekijät, ne eivät olleet käännöstekstejä alkuunkaan. 3. 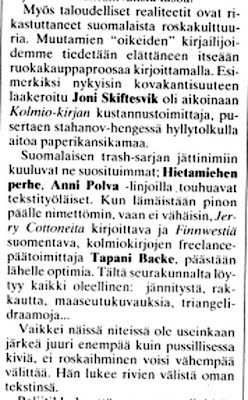 Joni Skiftesvik oli Kolmiokirjan kustannuspäällikkö, ei -toimittaja. 4. Hän ei "pusertanut hyllytolkulla aitoa paperikansikamaa", vaan ainoastaan yhden FinnWestin, yhden jatkokertomuksen FinnWestiin ja kolme lyhyttä täytenovellia Kostaja-nimiseen länkkärilehteen. Nämä kaikki on julkaistu sittemmin kirjassa Työtä arkkunikkarille. Skiftesvikin tilalle Räty olisi löytänyt paljon oikeampiakin ehdokkaita, kuten vaikkapa Kaarlo Isotalon, joka realististen romaaniensa ohessa tekaisi jatkuvasti lyhyitä viihdenovelleja Viikonlopun ja Perjantain kaltaisiin lehtiin. Someone pointed out earlier today at the Rara-Avis e-mail list (which is focused on hardboiled and noir crime writing) that Harlequin is bringing back into print some old crime novels. Here's a link. There are two titles by James Hadley Chase - I think those were reprints already back in the day. The other three novels are pretty obscure. The Dale Bogard one, Pardon My Body (gotta love these titles! ), was first published by Harlequin in 1951 - so it was one of their early original crime paperbacks, before they started concentrating on romance. "Dale Bogard" was a pseudonym for a British paperback hack Douglas Enefer, who wrote lots of other stuff, too, like some Cannon TV tie-ins in the seventies. I can't find any info on Perry Lindsay's No Nice Girl, but Alan Handley's Kiss Your Elbow (Kiss Your Elbow?) was originally published by McKay in 1948. The reprint came from Pyramid in 1950, under the pretty different-sounding title Terror in Times Square, but there must've been a Harlequin one. Okay, I couldn't leave this unchecked: Perry Lindsay was the same writer as Peggy Gaddis, who started out back in the 1920's and continued penning cheap romance and sleaze way into the sixties. 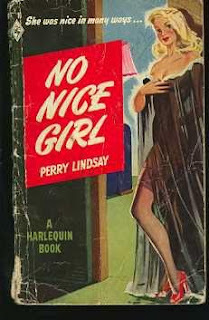 No Nice Girl was a Phoenix Press title in 1946 and the Harlequin reprint came in 1949. This information comes from Abebooks and is highly suspectible, but I'd like to hear otherwise. As I mentioned, I've been silent here for some days now, mainly because I've been both working frantically and trying to spend some time with my kids. Ottilia - who, you may remember, is currently living outside of Finland - is spending her summer holidays here and since her school starts later than is usual in Finland, we've been keeping Kauto away from daycare. The result: how the hell am I supposed to work frantically?! Anyway, it seems the zombie anthology I mentioned while back is finished and making its way into the printers next week. Another one bites the dust - or something to that effect. What I meant to say was that reading doesn't pay. I bought The Program by Gregg Hurwitz, an American crime writer, a while back from a thrift store only because it was cheap (80 cents, it says - and it's a hardcover, no DJ though) and because I vaguely remembered hearing Hurwitz's name somewhere. Then I noticed he has a story in Jennifer Jordan's acclaimed anthology Uncage Me, and as I was looking for something to read, I decided to dip into The Program. Not a wise move. You know, I've been busy. I should be reading more, I should be writing more, I should, I should, I should... The book seemed interesting, a bit hardboiled, a bit like a private eye novel. The premise was intriguing: a rich Hollywood producer asks a retired police officer to get back his adult stepdaughter from a mind cult, run by a charismatic mystery man. Okay, I said, this is original, even though, I think, Lew Archer had a similar case. I lingered on, when the action didn't begin. There were many interesting scenes, especially those that take place in the meetings of the cult. But finally, after reading this for over a week, I had to confess: I don't care. The problems of the lead character and his wife seemed overworked (and they were continuation to a book I haven't read, presumably an earlier one in the same series). There wasn't enough action or suspense. There were scenes in which I was thinking: how can this happen, these guys, an undercover cop and a cult member who's being under surveillance, just get away and walk into a meeting with psychologies to help the girl? I think I stopped reading The Program something like 50 pages before the end, because it never seemed very believable, even though Hurwitz had been clearly doing his homework about how mind cults work. This reminded me of 3:10 to Yuma, the new version from the Elmore Leonard story. The film was at times well made and it had some good action scenes (but too much posturing), but the most interesting thing about it was that it was about how mind cults work. Look at the scene in which Russell Crowe talks with his men about a member who got shot. It's exactly like the cult leader talks in Hurwitz's book. Crowe is a charismatic sociopath, who also gets to work inside Christian Bale's head. And here lies the problem within the film: it never resolves the questions it poses. Crowe is a scary psycho, yet he becomes like a father to Bale (and his older son). I don't understand what the writers were thinking. That becoming a father figure to a simple man who's had his share of tragedy (leg gone in Civil War) is something that can cure a sociopath? C'mon! I digress. Suffice to say that I got finally to Allan Guthrie's Savage Night and we don't have the same problems there. I posted a piece on a Finnish war-time fictionmag on one of my other blogs here. Sorry to have been so silent, trying to get the work routine back and getting some stuff out of my hands. 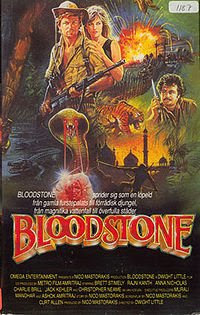 Raiders of the Lost Ark is a good bridge to what I'm really going to blog about: the half-Indian, half-American film called Bloodstone (1988). It's directed by Dwight Little, who's done lots of TV work and the sequel to Free Willy (which I liked more than the original, but I might be alone in my opinion; but hey, better than Free Willy - that can't be much asked, can it? ), from a script by Greek Nico Mastorakis, who is said to be (or probably says it himself in the Wikipedia article) a controversial figure, involved in lots of things. Many of the actors are Indian and there's a feel of a Bollywood adventure/musical/comedy in many of the set pieces and scenes in the film. Basically, the film is just an Indiana Jones rip-off, but due to its Indian connections it's interesting. But alas, it's only that. The story is pretty ordinary - there's this bloodstone, a marvellous jewel with which a beloved princess went to grave hundreds of years ago, there's this American couple spending time in India, there's this conniving thief who's been lucky enough to steal the bloodstone, there's this ruthless European collector who also wants the diamond etc. - and the European actors are all pretty lame, especially the romantic couple (and the woman isn't even good-looking! what were they thinking?). The Indian actors, some of which are famous in their homeland (especially Rajnikanth, who plays a swindling cab driver), are better, but with the story at hand there's not much to do. There might be potential for a good story about betrayals and criss-crosses, but the story neves gets enough speed. Maybe the budgetary limits prevented this taking on the adventure route the video cover hints at. There are some hints to classics, such as Jack Kehler's character, thief Paul Lorre, but they are a bit too obvious. Still I found this at least a bit entertaining, so if you come across a copy and feel like watching a cheesy adventure flick, go for it - especially if you're a Bollywood enthusiast.